Physically, FOTOCAT is an Excel spreadsheet of UFO and IFO cases where an image has been obtained on photo, film or video. It contains various data columns to register the date, time, location, province and country, explanation (if one exists), photographer’s name, special photographic features, references, etc. When completed, the full catalogue will be posted on the internet, for free access to the worldwide UFO community. The last catalogue count shows 8,786 cases on record. Because of their intrinsic potential importance, cases where images have been taken by automatic equipment from military aircraft were noted as “gun camera” in the Special Features column of the FOTOCAT spreadsheet. Now, the possibility arises that a future review paper will be devoted to reports where photographs were taken from aircraft, in general. For this purpose, FOTOCAT archives are being examined with the intention to search for all cases of this type on file and to add the notice “photographs from airplane” in the above-mentioned multiple-motif column. Also, for better computer-retrieval purposes, a new column called “Airborne” has been included into the catalogue’s structure, where an asterisk will mark all such cases for both civilian and military incidents. FOTOCAT Report #1, originally released in 2004, has been revised and enlarged. From the initial 101 cases, the current 81-page monograph reviews 115 photographic UFO sightings in the world during the wave year of 1954. It is profusely illustrated with all known UFO pictures of the period, plus case commentary for all recorded events, closing with a general statistical analysis of the registered cases. June 30, 1954, Skive (Denmark): a “solid-looking” lens flare appears during a total eclipse of the sun. © K.G. Jensen. October 15, 1954, Anchorage (Alaska). 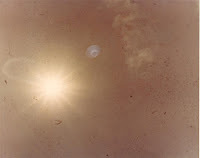 One of the rare UFO color photographs of the period. © Richard Beaulieu. This is pure UFO research in the making, and I hope you will enjoy the investigation done. Please feel free to let others know about it. Once more, my recognition goes to Matías Morey for making it possible. Santander (Spain), October 1991. 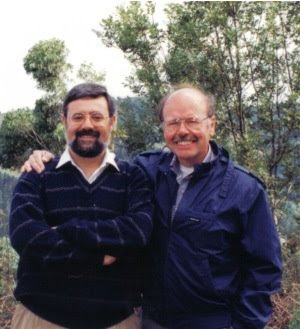 Dr. Richard Haines (right) and Vicente-Juan Ballester Olmos. 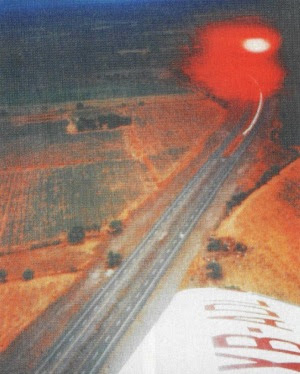 Example of supposed airborne UFO photograph: Atlixco, Puebla (Mexico), 1991, (alleged) police picture. The purpose of this note is to establish the basis for a future review paper centered on UAP images obtained from commercial, military and private aircraft, and it emerged quite naturally as the first author is an associate to NARCAP for Spain and Dr. Haines is the chief scientist of the Center. Also, both researchers are long-time friends and coworkers. In 1981, Dr. Haines wrote the foreword to Los OVNIS y la Ciencia (UFOs and Science), one of the books authored by Ballester Olmos. This section reports contributions received from new collaborators (or from regular ones whose most recent contribution is considered outstanding). In addition to the new names cited here, many others are regularly contributing to the enlargement of FOTOCAT. Heriberto Janosch (right) and V.J. Ballester Olmos, two of a kind ufologists. My estemeed friend and collaborator Heriberto Janosch González, an Argentinean-Spanish psychologist and computer analyst, in addition to serious student of UFOs, now living in Madrid, visited me on April 4, 2008. For several hours we had the opportunity to compare notes on a number of joint projects and case investigations in progress, and talk about the past, the present and the future of ufology and ufologists. During our first face-to-face meeting we enjoyed not only a very good conversation but also a typical Valencian paella. It was a true pleasure having Heri in my studio and we made plans to have other meetings with other colleagues in the near future. Indispensable help in document processing (a tedious step required prior to entering reports into FOTOCAT), is being provided by Carlos González Gutiérrez, from my home city of Valencia. Michele Porcheddu, from Italy, a sharp analyst specializing in photographic cases, is cooperating with our project by reviewing a number of classic cases I am working on currently. Additional assistance has been provided by experienced US researcher Tom DeMary, by British reseacher Robert Moore, creator of a major database for UK cases, by the noted French UFO investigator Gilles Munsch, from the CNEGU organization, by ufologist and writer Luis A. Reinoso, from Rosario (Argentina), and by Portuguese student Nuno Montez da Silveira. From Switzerland, the veteran researcher Bruno Mancussi has volunteered to review all issues of his collection of the old German UFO journal UFO-Nachrichten to extract reports of photographic sightings for FOTOCAT. Canary Island journalist Alfonso Ferrer was instrumental in spreading information in Spain on the Ballester-Haines article cited above. To them all, my gratitude. In 1960, Argentina’s Revista Nacional de Aeronáutica (National Journal of Aeronautics) published several articles on UFO sightings. Its November 1960 issue carried a letter submitted by Air Force Captain Hugo Francisco Luis Niotti, an active officer of the School of Sub Officers based in Córdoba (Argentina), which described that at 16:30 hours on July 3, 1960, motoring from Yacanto, 70 km before arriving to Córdoba, he saw an “object suspended in the air, some 100-120 meters at the right of the road”. He said he took some 40 seconds to halt the vehicle and take one photograph of it, and then the object disappeared in the following seconds into the low clouds banked at 80-100 meters of altitude. He had his camera loaded with 21º DIN film, diaphragm of 2.8 and 1/60 sec speed, and focused to infinity setting. Niotti described the object as cone-shaped, spinning on its own axis, and moving slowly to the South, “as a balloon carried out by the wind.” But then it increased its speed considerably, rising without producing any noise, smoke or flames. There was high humidity because some light rain was falling. The object was said to be hovering 10-15 meters over the ground. Niotti calculated that its diameter was 3-4 meters wide by 6-8 meters high (major axis), dark gray in color. Originally flying at a velocity of 5-7 km/hour, it accelerated to 200 km/hour in three seconds. 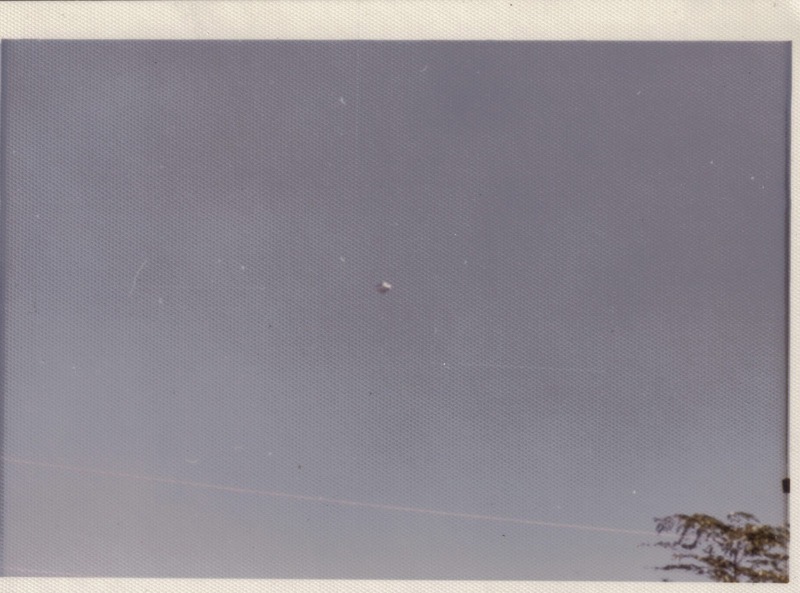 UFO pictured near Yacanto (Córdoba, Argentina), July 3, 1960. © Hugo F. Luis Niotti. The witness provided the original negative (only one picture was taken) to the magazine, which was examined by two photographic technicians of the Aeronautics Information Services, who concluded that “the developing process of the negative has been normal” and that it actually recorded an object. 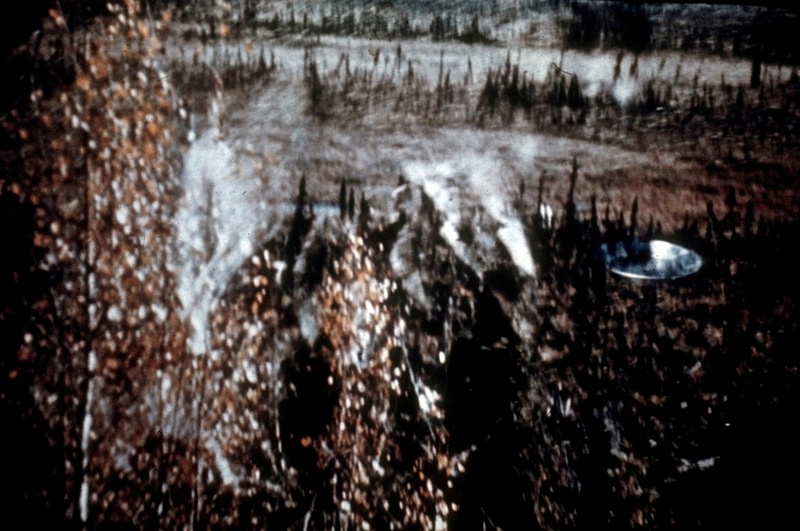 As the observer stated that the object’s base in the picture was darker than the original dark gray color he saw, the examiners attributed it “to the influence of unknown radiations” over the film. The appraisers do not seem to have presented anything more specific to support this hypothesis, however. Did Niotti present to the evaluators the full strip of negatives or just the one with the blot? Why did the examination concentrate only on the development process, as it seems? In reality, we have an isolated photograph of an alleged slow-moving object that inopportunely accelerated as soon as the witness started to take pictures. In the absence of any testimony and, judging merely from the appearance of the image, it looks like a stain or spot of the kind that it is produced during the chemical developing process. We knew that the Arizona-based organization Ground Saucer Watch (GSW) had analyzed this photograph, as received from Guillermo Roncoroni. Roncoroni, an IBM technician by trade, was the natural leader of the Buenos Aires association SIU, the editor of the journal UFO Press and one of the most serious ufologists in Argentina (but not devoid of beliefs.) Specializing in the early application of computers to the processing of UFO landing data, he was very fond of UFO photographs. Roncoroni died in 1999 and most of his archive of UFO slides was transferred to the FOTOCAT Project resources. We also knew that late in November 1978, Roncoroni submitted the Niotti photograph to GSW for analysis. A response was received on February 4, 1979. The study was signed by GSW`s director William H. Spaulding, and it disclosed that three other GSW consultants had participated in the analysis, Dr. Bruce Maccabee, Fred Adrian and David Rutland. Image analysis output produced by Ground Saucer Watch, Inc. on the Niotti photograph. 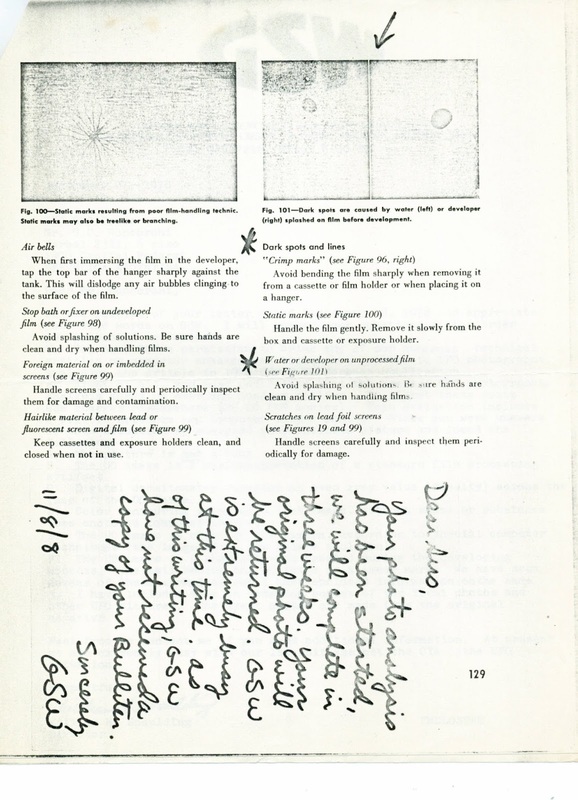 The analysis indicated that the UFO image was not fully circular, showing an asymmetry in its axes, something “highly uncommon in bonafide UFO photographs”, according to the GSW analysis, nevertheless it “substantiated” values for distance and size matching the ones given in the above letter by the witness, and it also mentioned a possible “power field” to explain the darker density of the bottom part of the object in the image, as the Argentina Aeronautics examination also suggested. Too perfect, in our view. The GSW analysis concluded that there was no evidence to claim that the UFO represents any known type of aircraft or weather balloon, not a model, not a montage, and that the conical shape appears to be metallic. Two-page analysis report by William Spaulding on the Niotti photograph, dated February 4, 1979. Roncoroni was a sober computer professional, I corresponded with him from 1978 to 1984, when we worked together in developing a codebook and exchanged experiences in computing work, and in my opinion he was the kind of person who finds it difficult to accept that a serious person can lie or spin a tale. He believed in the testimony of Captain Niotti, therefore the case was outstanding to him. But that was not the idea others in his own group had about the photograph. For instance, student Heriberto Janosch, who has always thought the tale was a hoax built upon the discovery of a developing flaw of a singular shape in the negative. Recently, Argentinean journalist and UFO researcher Alejandro Agostinelli sent to us scans of the GSW letters to Guillermo Roncoroni. 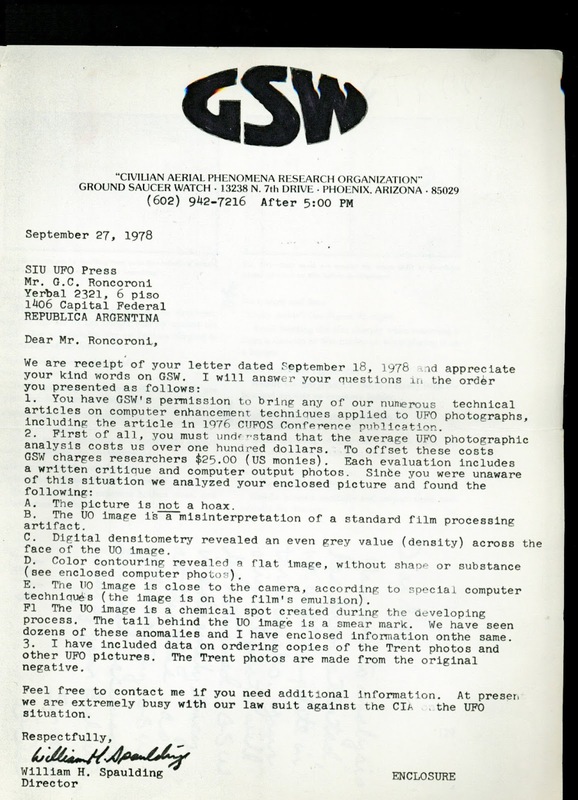 We already had that correspondence, but we found a two-page document that was new to us, an analysis report signed September 27, 1978 by GSW about a photograph sent by Roncoroni. Initially we did not know what picture was analyzed months before, but thanks to some advice from Heriberto Janosch, we realized it was a first study of GSW over the Niotti photograph, with totally opposite findings! The first report enclosed examples of similar developing effects from technical photographic literature. GSW report on the Niotti photograph, dated September 27, 1978, and enclosure. 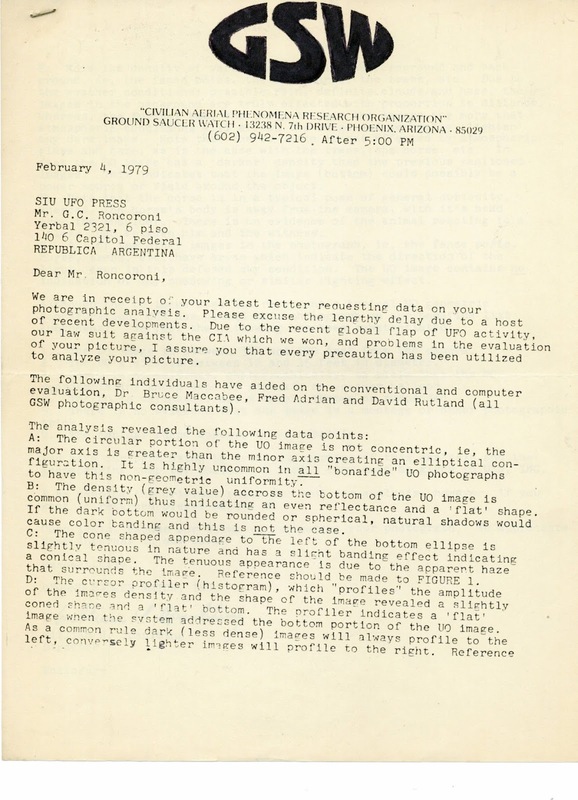 When Roncoroni received the initial negative results he got furious and he wrote back to Spaulding about his “error”, now giving him the clues about the personality of the author (presumably one who could never lie), and only then providing the size and distance calculations of the alleged observer (factual information, no doubt), as well as the “radiation” conclusion of the Aeronautics appraiser (a relevant key the GSW could not miss). Of course, all the GSW consultants re- worked the analysis to match the witness estimates and the Aeronautics official appraisal’s conclusions. Overnight, the smear in the negative became a material, flying object that could not be explained. Obviously, GSW did not dare to contradict a fully-stamped official report. Years later, GSW techniques and methods, and more specificaly, GSW biased interpretations of results, were under severe criticism by the ufological community in the United States and William Spaulding abandoned the field. All that remains are lots of nice-looking, colored Polaroid prints of the TV image outputs. What to say today about this single photograph? Was it just a development flaw or a distorted flying saucer that escaped to being photographed at pleasure? The US engineer Larry Robinson featured this picture as a hoax. I requested the reason why and he wrote: Examining the photo shows the object to be within a few feet of the camera. There is no scattering to lighten the object as there should be if the object were large and distant. Unfortunately, Hugo F. Luis Niotti died on January 2008 and he cannot be confronted with these facts. On http://fotocat.blogspot.com/2007_01_29_archive.html (under the title “1942 China Image Solved?”) we clarified the nature of an old, alleged UFO photograph. A disk-shaped object over the middle of a street in a China town was just a hanging lamp. Thanks to the courtesy of Belgian researcher Patrick Ferryn, we have received another example of this type of photograph from a remote place. The picture was submitted by the grandson of a high-ranking French civil servant in the colonnial administration of ancient Dahomey (now Benin), Africa, during the period 1925-1933. The picture, taken from the family album, belongs to a series of photographs made in the city of Porto-Novo circa 1928-1929. This portrait shows a panorama of Victor Ballat Street. © Jean Avonts Saint Lager. The owner of the photo is puzzled by the fact one cannot see any wires linking the summit of the wooden pole (in the middle of the picture) to the object. An expert was consulted. Joe Maurath, Jr. has an amazing collection and a very interesting website devoted to vintage streetlights, and he replied: It definitely is a span-wire incandescent fixture which was rather similar to those used in the US from ca. 1900-1950 on a rather widespread basis for illuminating busy intersections. Close-up of the “UFO” after image treatment. Wires are visible now. © Patrick Ferryn. It is the effect of lighting conditions of the scene (illumination from the sun), the duration of the exposure, the processing of the negative, the printing of the picture, or a combination of these factors what impedes the cables from being visible...until the photograph is enhanced and the bad contrast effect is removed to the point to show that wires are present. Two annual peaks of reports can be observed in 1974 and 1978, with an equal number of 222 cases each. Overall, in this ten year period, the average number of reports per year is roughly half the number compared to the two peak years. The lowest number of reports is from 1970 with only 75 entries. On average over the 10 year period, 56% of incidents are unexplained (UFO) while 44% are explained (IFO). 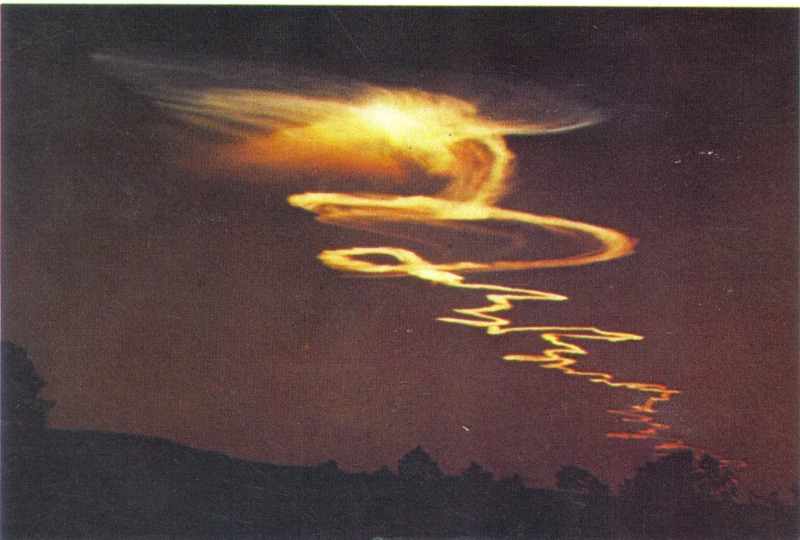 These figures are held constant in most years, with the exception of 1974 and 1979, where the ratio becomes inverted to 44% (UFO) vs. 56% (IFO): the most probable reason for the inverse proportion is that in both years there were some missile test launches, and subsequent observations generated a large quantity of photographs. Graph 1. Yearly distribution of FOTOCAT reports, 1970-1979, split by UFO and IFO. Spain (ESP) takes the lead in this table, not in vain there has been a large compilation effort by this author, complemented with the many image captures of ballistic missile tests by France and the USA seen from peninsular Spain or the Canary Islands in 1974 and 1979, and the frequent experiences with infrared photography in Andalucia in the last part of the decade. USA follows next, as expected. FOTOCAT has devoted special work to collect reports from Argentina, Norway or Australia and that increased the overall international count. Italy’s input is due to Maurizio Verga’s PHOTOCAT. Switzerland’s (CHE) higher position is due to the abundant (yet underestimated) material provided by contactee Eduard “Billy” Meier. June 12, 1974, Moya (Barcelona, Spain). Vapor trail of a French ballistic missile. © Renom. November 11, 1972, Mesa, Arizona. A UFO or a captive balloon? © Lee Elders. The various national “flaps” (in US Air Force terminology, a condition characterized by an advanced state of confusion!) are highlighted. Waves occurred here and there without any discernable pattern. The major wave of 1973 in the United States has no correlate either in Europe, Latin America, Asia or Oceania. Neighbor countries do not share flap periods neither. Why do we find this chaos in the data, and within, generally, national borders? • An Alien in a Chilean Park? In this paper a restoration of the photograph was achieved, thanks to a semi-blind deconvolution method based on cepstral and spectral analysis. The findings show that the subject in the image might simply be a child. Other hypotheses and published analyses on this case are also reviewed. This is a brief item report for the serious and critical-minded UFO researcher. Some selected information sources which I judge of interest for gaining knowledge from a scientifically-oriented perspective is provided. Under the generic title (in Spanish) “Sixty Years After the Arnold Case - A Survey”, Mr. Campo has compiled a mosaic of opinions from 18 UFO students worldwide, eight from Spain and ten from foreign countries. Among distinguished researchers, thinkers and authors from Europe and America included in this survey are Alejandro Agostinelli (Argentina), Peter Brookesmith (England), Martin Kottmeyer (USA), Philip Mantle (England), Kevin Randle (USA), Larry Robinson (USA), Peter Rogerson (England), Edoardo Russo (Italy), Maurizio Verga (Italy) and Nigel Watson (England), and, from Spain, J.M. Alcíbar, J. Arcas Gilardi, M. Borraz Aymerich, L.A. Gámez, L. R. González, A. Petit and J. Ruesga. The survey coordinator also opted to include the reflections of yours truly, V.J. Ballester Olmos. V.J. 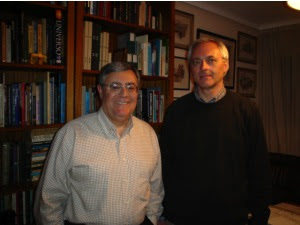 Ballester Olmos (left) and Ricardo Campo Pérez standing by the former’s study library. The three common questions that Ricardo Campo posed to all those interviewed, and my own responses to them, will be found for those interested in the Spanish section of the present update (see below). The questions were formulated from a skeptical perspective –more than my own blend– and these are fully pertinent to the end that was intended to be achieved, which was to provide a general review and perspective on and of UFO research worldwide after six decades of UFO phenomena. Studies on ball lightning and other rare forms of atmospheric electricity are matters of interest to UFO researchers. The reasons are quite obvious. Thanks to Dr. Alex Keul, we have been informed of a conference held in Kaliningrad (Russia), July 7- 12, 2008. Under the general heading of “Atmosphere, Ionosphere, Safety”, the congress dealt with the topic “Electromagnetic and Optical Phenomena in the Amosphere, Including Long-Lived and Plasma Objects.” For further information, the program index can be found in a .pdf file here. The following five books by Vicente-Juan Ballester Olmos –all of them out of print– can be purchased as a single package for 100 € (or 150 US dollars) plus shipping costs. The books will be signed by the author. We will supply you with state, regional, provincial or national catalogues for you to check and enlarge. El último cómputo refleja 8.786 entradas en el catálogo. Por su intrínseca importancia potencial, los casos en que imágenes se adquirieron vía equipos automáticos a bordo de aviones militares están registradas con la notación “gun camera” en la columna de Special Features de la hoja de cálculo de FOTOCAT. Ahora, dado que existe la posibilidad de realizar un futuro trabajo centrado exclusivamente en los informes de fotografías obtenidas desde aviones en vuelo, estamos examinando nuestros archivos con la finalidad de buscar todos los casos de ese tipo y añadir la notación “photographs from airplane” en la mencionada columna de informaciones múltiples. Asimismo, y para una fácil recolección de los casos para su estudio, hemos añadido a la estructura del catálogo una nueva columna con el nombre “Airborne”, donde un asterisco identificará los casos de incidentes aéreos tanto civiles (vuelos comerciales, aviones privados, helicópteros, etc. ), como militares. El Informe FOTOCAT #1, originalmente publicado en 2004, se ha ampliado y revisado completamente. De los 101 casos recogidos inicialmente, hoy es una monografía de 81 páginas que pasa revista a 115 informes OVNI fotográficos ocurridos en todo el mundo durante el año oleada de 1954. Está profusamente ilustrado con todas las fotos e imágenes del periodo, cada caso tiene un comentario propio y se cierra con un análisis estadístico general de todos los sucesos catalogados. 30 de junio de 1954, Skive (Dinamarca): un reflejo de aspecto sólido aparece durante un eclipse total de sol. © K.G. Jensen. 15 de octubre de 1954, Anchorage (Alaska). Una de las escasas fotografías a color de la época mostrando un presunto OVNI. © Richard Beaulieu. Espero que esta nueva investigación, fruto del trabajo del proyecto FOTOCAT, sea de interés general. Animo a divulgar esta nueva referencia entre aquellos todavía interesados en la ufología pura y dura. Mi agradecimiento nuevamente a Matías Morey, por hacerlo posible. Santander, octubre de 1991. El doctor Richard Haines (a la derecha) junto a Vicente- Juan Ballester Olmos, durante las jornadas internacionales de Cuadernos de Ufología. Ejemplo de una característica imagen OVNI tomada desde el aire: Atlixco, Puebla (Méjico), 1991. Se trata de una (supuesta) foto policial. La finalidad de este artículo es sentar las bases para un futuro ensayo centrado en las imágenes OVNI/FANI obtenidas desde aviones comerciales, militares o privados. Éste programa ha surgido de forma natural ya que soy asociado del NARCAP para España y el Dr. Haines es el director científico de dicho centro. Además, ambos investigadores somos amigos y colaboradores desde hace muchos años. No en vano en 1981 Haines prologó mi libro Los OVNIS y la Ciencia, escrito con Miguel Guasp. Heriberto Janosch (derecha) y V.J. Ballester Olmos, dos ufólogos tal para cual. El pasado 4 de abril tuve la satisfacción de recibir la visita de mi estimado amigo y colaborador Heriberto Janosch González, psicólogo y analista informático hispano-argentino, además de reputado estudioso de los OVNIS, actualmente residiendo en Madrid. Durante las varias horas que pasamos juntos tuvimos la oportunidad de cubrir varios proyectos e investigaciones conjuntas que estamos desarrollando y charlar sobre el pasado, presente y futuro de la ufología y de los ufólogos. Aprovechamos esta primera reunión cara a cara para disfrutar de una buena conversación y también de una típica paella valenciana. Ha sido un verdadero placer tener a Heri en mi estudio y de hacer planes para futuros encuentros con otros colegas. Una ayuda indispensable en procesar documentación, un tedioso paso previo al registro de informes en FOTOCAT, me está siendo facilitada por el bibliófilo valenciano Carlos González Gutiérrez. El italiano Michele Porcheddu, un inteligente analista especializado en casos fotográficos, está cooperando con nuestro proyecto revisitando algunos episodios clásicos con los que estoy trabajando. Hemos recibido recientemente asistencia documental del experimentado investigador norteamericano Tom DeMary, del británico Robert Moore, creador de una base de datos para sucesos ovni del Reino Unido, del riguroso estudioso francés Gilles Munsch, de la organización CNEGU, del ufólogo y escritor Luis A. Reinoso, de Rosario (Argentina) y del estudioso portugués Nuno Montez da Silveira. Desde Suiza, el veterano investigador Bruno Mancussi se ha prestado voluntario para revisar su colección completa de números de la antigua revista alemana UFO-Nachrichten para sacar informes de casos fotográficos para FOTOCAT. El periodista canario Alfonso Ferrer ha ayudado en la difusión en España de la información relativa al artículo Ballester-Haines. A todos ellos, mi agradecimiento. Ya en 1960, la argentina Revista Nacional de Aeronáutica había publicado artículos sobre observaciones OVNI en varias ocasiones. En el número de noviembre de 1960 salió una carta remitida por el oficial de Aeronáutica capitán Hugo Francisco Luis Niotti, que presta servicio en la Escuela de Aeronáutica de Córdoba (Argentina), que relataba cómo a las 16,30 horas del 3 de julio de 1960, viajando en coche desde Yacanto, y a unos 70 km antes de llegar a Córdoba, vio “un objeto suspendido en el aire a unos 100-120 metros a la derecha del camino”. Señaló que le llevó unos 40 segundos parar el vehículo y tomar una fotografía del objeto, y en los siguientes segundos éste desapareció entre nubes bajas que se hallaban a 80-100 metros de altura. Se usó película de 21º DIN, con diafragma de 2,8 y 1/60 de segundo, de velocidad, estando en infinito el indicador de distancia. Niotti describió el objeto con forma de tronco de cono, que giraba sobre su eje y en un principio se desplazaba lentamente hacia el Sur, “como un globo llevado por el viento”, pero luego su velocidad aumentó considerablemente, elevándose sin producir un ruido apreciable ni despedir humo, llamas o cualquier otra cosa. La humedad era muy elevada y caía una ligera llovizna. El objeto se encontraba a unos 10-15 metros del suelo y Niotti le calculó que su diámetro tendría 3-4 metros por 6-8 metros de altura (eje mayor), de un color gris oscuro o parduzco. Su velocidad inicial era de 5-7 km/hora, con una aceleración final rápida que lo llevó a unos 200 km/hora en 3 segundos, más o menos. OVNI fotografiado cerca de Yacanto (Córdoba, Argentina), 3 de julio de 1960. © Hugo F. Luis Niotti. El testigo facilitó a la revista el negativo original (sólo pudo tomar una fotografía), el cual fue examinado por dos técnicos fotógrafos del Servicio de Informaciones de Aeronáutica; de su examen se desprendió “que el proceso de revelado de dicho negativo ha sido normal”, pudiéndose afirmar que existe el registro de un objeto. Dado que el observador había manifestado que la base del objeto opaco no aparecía tan oscura como registró la foto, los técnicos lo atribuyeron “a la influencia de radiaciones de naturaleza desconocida” sobre la película. Pero los técnicos no presentaron nada sólido para argumentar esta hipótesis. Nosotros nos preguntamos si Niotti aportó a la revista la tira completa de clisés o bien sólo el negativo afectado. ¿Y por qué el examen se concentró en el procesado de revelado? En realidad, sólo disponemos de una fotografía única de un objeto que volaba lentamente y que aceleró inoportunamente cuando el testigo comenzó a retratarlo. Haciendo abstracción del testimonio, y juzgando meramente a partir del aspecto de la imagen, ésta nos parece una mancha del mismo tipo que se produce a veces durante el proceso de revelado químico. Sabíamos que la organización de Arizona Ground Saucer Watch había analizado la fotografía, remitida por Guillermo Roncoroni. Roncoroni, técnico de la empresa IBM, era el líder indiscutible del SIU, una asociación de Buenos Aires, director de su revista UFO Press y uno de los ufólogos más serios de Argentina (aunque no exento de creencias). Especializado en la temprana aplicación de ordenadores en el proceso de datos de casos de aterrizajes OVNI, también era muy aficionado a coleccionar fotografías de OVNIS. Roncoroni falleció en 1999 y la mayoría de su archivo de diapositivas se transfirió a los fondos del proyecto FOTOCAT. Era sabido que a finales de noviembre de 1978 Roncoroni mandó la foto de Niotti al GSW para su análisis. La respuesta llegó el 4 de febrero de 1979. El estudio estaba firmado por el director del GSW, William H. Spaulding, y en el mismo intervinieron hasta tres de sus consultores, el Dr. Bruce Maccabee, Fred Adrian y David Rutland. Imágenes generadas por el análisis de Ground Saucer Watch, Inc. sobre la foto de Niotti. El análisis comenzaba revelando que la imagen OVNI no es totalmente circular, mostrando una asimetría en sus ejes considerada algo “extremadamente raro en las fotografía OVNI auténticas”. A pesar de ello, el análisis “sustanció” los valores de distancia y tamaño dados precisamente en la carta del testigo y asimismo justificaba un posible “campo de energía” para la imagen inferior, como sugería la opinión de los fotógrafos de la Aeronáutica argentina. Demasiado perfecto, a nuestro juicio. El análisis del GSW finalizaba indicando que no hay evidencia alguna de que se tratara de un avión, globo sonda, modelo o montaje y que el objeto cónico parece ser metálico. Informe de dos páginas de William Spaulding, sobre la fotografía de Niotti, fechado el 4 de febrero de 1979. Roncoroni era un profesional serio, yo tuve la satisfacción de mantener intercambio epistolar con él regularmente entre 1978 y 1984, cuando trabajamos juntos en el desarrollo de un sistema de codificación e intercambiamos nuestras respectivas experiencias de investigación con el proceso informático de casos de aterrizaje OVN; en mi opinión, era la clase de persona que le cuesta trabajo admitir que un militar, por ejemplo, mintiera o gastara una broma. Roncoroni creía a pies juntillas en el testimonio del capitán Niotti y el caso era verdaderamente sobresaliente para él. Pero no era esa la misma idea sobre la fotografía que tenían otros miembros de su grupo bonaerense. Por ejemplo, el estudioso Heriberto Janosch, que siempre ha creído que se había tratado de una broma basada en el hallazgo de una peculiar forma en el negativo debida al proceso de revelado. Hace poco, el periodista e investigador argentino Alejandro Agostinelli nos mandó copias del juego de cartas recibidas por Roncoroni del GSW. 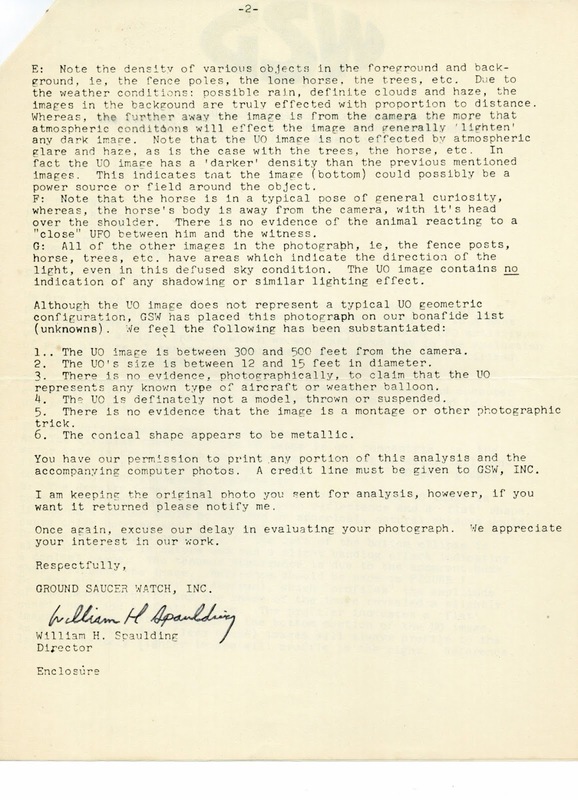 Ya conocíamos esa correspondencia, pero encontramos un documento de dos páginas que era nuevo para nosotros, se trata de un análisis firmado por el grupo ufológico norteamericano el 27 de septiembre de 1978 sobre una fotografía remitida por Roncoroni. Al principio pensamos que la fotografía analizada pocos meses antes era otra, pero Heriberto Janosch nos informó, sin lugar a dudas, que era un primer estudio del GSW sobre la foto de Niotti, pero ¡con resultados diametralmente opuestos! Cuando decidimos que había que exponer este hallazgo a través del blog, revisamos la documentación completa que sobre el caso tenemos en los archivos de FOTOCAT. Allí encontramos un escrito de un veterano ufólogo de Capital Federal, preparado a finales de los noventa o principios de este siglo, confirmando esta interpretación. Según dicho texto, Roncoroni mandó originalmente la foto al GSW sin mencionar quien era el autor, ni dar información sobre el testimonio del testigo ni tampoco la opinión de los técnicos de la Aeronáutica argentina. Mandó sólo la fotografía “para no predisponer un resultado”. Este primer informe adjuntaba algunos ejemplos de similares efectos de revelado extraídos de la literatura técnica fotográfica. Informe del GSW de la fotografía de Niotti fechado el 27 de septiembre de 1978 y anexo. Cuando Roncoroni recibió estos primeros resultados –negativos– se puso furioso y volvió a escribir a Spaulding para que subsanara su “error”, dándole detallada cuenta de la personalidad del autor de la foto (presumiblemente alguien incapaz de mentir), facilitándole las estimaciones de diámetro y distancia del observador (sin duda una información real), así como la opinión sobre la “radiación desconocida” de los también desconocidos analistas aeronáuticos (dato clave que GSW no debería pasar por alto). Naturalmente, los consultores de la GSW repitieron el análisis y coincidieron esta vez con los cálculos del testigo acerca del objeto y hasta con la conjeturas de los fotógrafos de la Aeronáutica argentina. De la noche a la mañana, una mancha en el negativo se convirtió en un objeto volante material que carece de explicación. Obviamente, la GSW no se atrevió a contradecir un informe lleno de sellos oficiales. Años más tarde, las técnicas y métodos empleados por la GSW, o mejor aún, las tendenciosas interpretaciones de sus resultados, fueron objeto de duras críticas por parte de los medios ufológicos de Estados Unidos, a resultas de lo cual Spaulding abandonó la ufología. Todo lo que queda hoy son muchas coloristas fotos Polaroid de las imágenes analizadas sacadas del monitor de televisión. ¿Qué podemos decir en la actualidad de esta única fotografía? ¿Fue simplemente un fallo de revelado o un platillo volante distorsionado que escapó justo cuando iba a ser fotografiado a placer? El ingeniero norteamericano Larry Robinson ha calificado esta foto de fraude. Preguntado por sus razones, contestó: El examen de la foto muestra que el objeto se encuentra a pocos centímetros de la cámara. No se aprecia la dispersión que aparecería si se tratara de un objeto grande y distante. Desgraciadamente, Hugo F. Luís Niotti falleció en enero de 2008 y ya no podemos plantearle estos hechos. En este mismo blog http://fotocat.blogspot.com/2007_01_29_archive.html y bajo el título “OVNI en China en 1942, ¿resuelto?”, ya clarificamos la naturaleza de una antigua fotografía OVNI. Un cuerpo en forma de disco suspendido en medio de la calle de una ciudad china era sólo una lámpara colgante de iluminación. Gracias ahora a la cortesía del investigador belga Patrick Ferryn tenemos otro ejemplo semejante también procedente de un lugar remoto. La fotografía la ha remitido el nieto de un funcionario francés de alto rango de la administración colonial del antiguo Dahomey (hoy en día, Benin), en frica, durante el periodo 1925-1933. La fotografía, extraída del álbum familiar, pertenece a una serie de retratos hechos en la ciudad de Porto-Novo alrededor de 1928-1929. La foto muestra el panorama callejero de la calle Victor Ballat. Al propietario de la foto le extraña el hecho que no se vean cables que unan la punta del poste de madera (en el medio de la foto) al objeto colgado en el aire. Consultado el experto Joe Maurath, Jr., poseedor de una impresionante colección y una página web muy interesante dedicada a los faroles de calle antiguos, éste ha contestado lo siguiente: Definitivamente se trata de una lámpara de incandescencia sostenida por alambres que era bastante similar a las usadas en los Estados Unidos entre 1900 y 1950 de forma muy generalizada para iluminar cruces muy populosos. Ampliación del supuesto “OVNI” tras tratamiento de la imagen. © Patrick Ferryn. Es el efecto de las condiciones de luz de la escena (la iluminación del sol), la duración de la exposición, el revelado del negativo, la impresión de la fotografía, o una combinación de esos factores, lo que impide que los cables que sostienen la lámpara sean visibles...hasta que la foto se le somete a una mejora informática para eliminar los efectos del contraste hasta el punto de hacer presentes con claridad los alambres que la sostienen al poste. Observamos dos repuntes anuales en 1974 y 1978, de una intensidad pareja de 222 casos cada uno. Los restantes diez meses aportan en media la mitad de dicha cifra. El año más pobre es 1970 que tiene sólo 75 casos. En términos generales, el 56% de los incidentes quedan sin explicar (OVNI), mientras el 44% están solucionados (no-OVNI). Esas cifras se mantienen constantes en la mayoría de los años, con la excepción de 1974 y 1979 donde el ratio se invierte a 44(OVNI)/56 (no-OVNI), debido a que en ambos años se dieron un par de observaciones de misiles que fueron fotografiados por numerosos testigos oculares. Gráfico 1. Distribución anual de los informes en la base de datos FOTOCAT, 1970- 1979, según sean OVNI o no-OVNI. España se sitúa como líder en la lista, no en vano estamos haciendo una trabajosa búsqueda de informes de avistamientos fotográficos, y se complementa con las muchas imágenes capturadas de pruebas de misíles balísticos de Francia o los Estados Unidos, registradas en la Península o en las Islas Canarias en 1974 y 1979, así como las frecuentes experiencias con película infrarroja hechas en Andalucía en la segunda mitad de la década. Estados Unidos le sigue en la tabla, como era de esperar. FOTOCAT se ha dedicado con intensidad a recopilar información de países como Argentina, Noruega o Australia y ello se refleja en la tabulación. El aporte de Italia se debe al excelente PHOTOCAT de Maurizio Verga. En cuanto a la adelantada posición de Suiza (CHE), se debe al abundante (pero todavía infraestimado) material procedente del contactado Eduard “Billy” Meier. (*) Incluye 43 series de fotos del disparo de un misil balístico francés MSBS desde el CEL, 12 de junio de 1974. (†) Incluye 30 grupos de fotos del lanzamiento de un misil Poseidon de la Marina de los EE.UU, 5 de marzo de 1979. ( ‡)Incluye 17 series de fotos del disparo de un misil balístico francés MSBS desde el CEL, 12 de junio de 1974. 12 de junio de 1974, Moya (Barcelona). Estela de vapor dejada por el paso de un misil balístico francés. © Renom. 11 de noviembre de 1972, Mesa (Arizona). ¿OVNI o globo cautivo? © Lee Elders. Se han resaltado a color los varios flaps nacionales (en la terminología de la Fuerza Aérea norteamericana, una condición caracterizada por un avanzado estado de confusión). Las oleadas ocurren aquí y allá sin orden ni concierto. La gran oleada de 1973 en los Estados Unidos no tiene correlato en Europa, Latinoamérica, Asia u Oceanía. Los países vecinos tampoco comparten periodos de oleada. ¿Por qué hay este caos en los datos? • ¿Un alienígena en un parque chileno? En este trabajo se realiza una restauración de la fotografía, gracias a un método de deconvolución semiciega basada en el análisis cepstral y espectral. El resultado muestra que el sujeto fotografiado puede ser simplemente un niño. También se discuten otras hipótesis y análisis publicados sobre el caso. Bajo el título genérico de “A sesenta años del caso Arnold. Encuesta”, Campo ha recogido un mosaico de opiniones de 18 estudiosos, ocho españoles y diez extranjeros. Entre distinguidos investigadores, pensadores y autores de Europa y América como A. Agostinelli, P. Brookesmith, M. Kottmeyer, P. Mantle, K. Randle, L. Robinson, P. Rogerson, E. Russo, M. Verga y N. Watson, y los nacionales J.M. Alcíbar, J. Arcas Gilardi, M. Borraz Aymerich, L.A. Gámez, L. R. González, A. Petit y J. Ruesga, el autor de la encuesta ha querido contar también con las reflexiones de su s.s.s. V.J. Ballester Olmos. V.J. 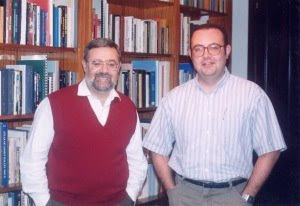 Ballester Olmos (a la izquierda) y Ricardo Campo Pérez posan junto a la biblioteca del estudio del primero en su casa de Valencia. Seguidamente, incluyo las tres preguntas comunes que Ricardo Campo formuló a todos sus entrevistados, y mis respuestas a tales cuestiones, por si fuera del interés del lector. Como se apreciará, las preguntas están hechas desde una posición escéptica -más que la mía propia- y son totalmente pertinentes para el fin que se quería conseguir, tener una visión actual de la ufología después de seis décadas de fenómeno OVNI. – 1. ¿Cuáles fueron sus inicios en el terreno ufológico y qué le llevó a implicarse en esta materia? ¿Por qué y en qué medida ha pervivido su interés a pesar de la natural evolución intelectual? –A principios de los años sesenta, siendo un mozalbete de 15 años, me sentía atraído por las ciencias de la naturaleza, tenía las inquietudes del explorador (arqueología, botánica, vulcanismo) y me entusiasmaban las informaciones del espacio (astronomía e incipiente astronáutica). Mi afición a estas últimas materias derivó de mi asiduidad a la lectura de los tebeos de “Diego Valor”, entre 1954 y 1956, en plena niñez. Cuando comencé a leer libros de astronomía, a mediados de los sesenta, leí una obra del ruso V.A. Firsoff en donde mencionaba la existencia de los platillos volantes, perseguidos por cazas norteamericanos, y aquello terminó de encender mi pasión por el tema. En 1968, fundé el CEONI en el campus de la Universidad de Valencia, entidad que finalizó su actividad grupal en 1973. Desde entonces he seguido investigando el fenómeno de los OVNIS ininterrumpidamente. Tras 30 años de vida profesional en áreas de Finanzas, a partir de 2006 puedo ocuparme full time al estudio de esta materia. Fundamentalmente, las razones por las que ha pervivido mi interés en el fenómeno OVNI se debe a haber descubierto la complejidad del mismo, la existencia de episodios que no han sido satisfactoriamente resueltos, el estimulo diario para aprender y consultar numerosas informaciones y disciplinas científicas y el deseo de contribuir a sistematizar el conocimiento que existe en torno a este misterio de nuestro tiempo. –2. Detállenos su evolución en el tiempo en que estuvo involucrado en la investigación de la materia ufológica, y los principales episodios en los que se implicó. ¿Cuáles son sus objetivos con respecto a sus últimos proyectos? –Una respuesta detallada sería extremadamente prolija, ya que han sido más de 40 años de actividad continuada y de publicaciones y libros. Remito al lector a mi bibliografía en http://cdufo.info/bib/bibliog1.pdf. A diferencia de aquellos que se han obsesionado por la creencia de que los platillos volantes de antaño eran de origen extraterrestre o de quienes aceptan crédulamente la visita de seres de otros planetas en sus naves espaciales, yo siempre he mantenido una postura crítica o escéptica en la materia, aunque es evidente que en los primeros años me sentía inclinado hacia la naturaleza física y material del fenómeno, que adivinaba real e inexplicable. Con el curso de los años, una intensa lectura en varios idiomas –mi biblioteca debe ser una de las más completas de España en esta especialidad literaria–, una no menos extensa correspondencia con cualquiera que tuviera algo que aportar al respecto, y sobre todo mi propia investigación, tanto de campo como el análisis de gabinete, me han convencido de que la casi totalidad de la casuística es banal y puede explicarse por causas domésticas, naturales o artificiales, pero de naturaleza convencional. Mi actual nivel de escepticismo es, pues, empírico y no teórico ni fruto de ideas preconcebidas. Y echando la vista atrás, compruebo que el problema principal reside en la creencia predeterminada del investigador hacia un esquema concreto de las cosas, la hipótesis extraterrestre en particular. Cuando alguien está predispuesto a creer –por suposición, expectativa interna o influencia de lecturas- que los relatos de avistamientos OVNI han ocurrido realmente con la dosis de sensacionalismo con la que se describen en revistas y libros, se es incapaz de admitir otras posibilidades. Es un ejercicio mental vigoroso lo que se requiere para escapar de esa burbuja no reciclable hacia otros planteamientos más coincidentes con la realidad. Es un paso imprescindible para librarte de esas concepciones de ciencia ficción y moverte en el sentido de una mente abierta y sin prejuicios lo que te permite ver el desarrollo del fenómeno OVNI desde una perspectiva objetiva. En cuanto a la última parte de la pregunta, sólo responder que he estado implicado en la encuesta de muchos episodios, algunos de ellos ya clásicos en la ufología nacional, y que el rango de mis ocupaciones en ufología ha sido muy extenso, cubriendo desde el estudio del fenómeno de los aterrizajes OVNI en la Península Ibérica, a trabajos sobre metodología, estadística, bibliografías técnicas, investigación sobre observaciones OVNI por militares y cuerpos de seguridad, encuesta sobre el terreno de avistamientos, proposición y seguimiento del proceso de desclasificación de los expedientes OVNI del Ejército del Aire, artículos, libros, conferencias internacionales, etc. –3. Han transcurrido 60 años desde el inicio de la gran leyenda de los ovnis. En todo este tiempo no se ha producido un descubrimiento clave, ni parece probable que se produzca en el futuro. ¿Cómo interpreta este hecho y cuál es su posición actual respecto a la ufología y sus variados escenarios? –Estaba leyendo estos días unos textos sobre el inicio de la investigación militar sobre ovnis en Estados Unidos en 1947 y reflexioné sobre la obviedad que resulta constatar como agencias como el FBI o la contra-inteligencia del Ejército norteamericano ya afirmaban entonces la inexistencia de vestigios materiales de OVNIS (léase platillos estrellados), habida cuenta de las toneladas de tinta vertidas más tarde sobre el mito de Roswell. Y es que la información está ahí, para hacer las correctas inferencias lógicas, pero cuando el intelecto está obnubilado por el velo de las creencias, se es incapaz de ver la verdad y uno cae en la trampa de la irrealidad o del mito. Bien es verdad que en muchos casos –sobre todo los productores de literatura sensacionalista- ello se hace a propósito, con la finalidad de crear y extender leyendas y seguir teniendo excusa para explotarlas y medrar a su costa. Espero que algún día se le de categoría de fraude al consumidor y se actúe en consecuencia. Es cierto que lo que no ha ocurrido ya en estos 60 años no creo vaya a ocurrir en lo sucesivo; el misterio de los OVNIS ya está momificado y es labor para historiadores, antropólogos y sociólogos, más que para el científico orientado a las ciencias físicas (a pesar de que hay algunos ejemplos de casuística con rasgos anómalos que sí requieren ese tipo de análisis). Mi posicionamiento es claramente hacia una ufología rigurosa con los hechos y crítica con los especuladores, que se presenta como excusa para adquirir conocimiento y que permite compartir foros con colegas de los que uno siempre aprende. Y si, de paso, se puede hacer alguna aportación intelectual positiva al revuelto panorama del estudio de los fenómenos OVNI, motivo más de satisfacción. Gráfico 2. Número de casos registrados en FOTOCAT por década (1950-2005). Nuevamente el Comité Italiano para el Proyecto Hessdalen ha producido un trabajo extraordinario: Luminous Transient Phenomena in the Atmosphere (LTPA), “Fenómenos luminosos transitorios en la atmósfera”. Es una base de datos en línea (de acceso directo vía internet) de referencias bibliográficas de la literatura internacional relativas a un amplio rango de temas que se refieren a la aurora boreal, electricidad atmosférica, rayo en bola, ”Earth lights”, luces de terremotos, fenómenos Hessdalen, fuegos fatuos, plasmas de vida larga, nubes noctilucenses, TLP y fenómenos semejantes. La base de datos se actualiza continuamente y actualmente contiene 4,868 entradas, ¡en 487 páginas! Se presenta siguiendo estrictos criterios científicos. Usando un vasto conjunto de campos, la bibliografía permite capturar la información de una manera rápida y sencilla. Los estudios sobre el huidizo fenómeno del rayo en bola o rayo globular (llamado centella en Latinoamérica) y otras formas de electricidad atmosférica son asuntos que interesan mucho a los ufólogos. Por razones bastante obvias. Gracias a nuestro amigo el Dr. Alex Keul, hemos conocido la conferencia llevada a cabo en Kaliningrado (Rusia) del 7 al 12 de julio de 2008. Bajo el epígrafe general “Atmósfera, Ionosfera, Seguridad”, el congreso se ocupó de los “Fenómenos ópticos y electromagnéticos en la atmósfera, incluyendo plasmas de larga duración”. Los siguientes cinco libros de Vicente-Juan Ballester Olmos –todos ellos agotados- pueden adquirirse en bloque en una ocasión única por el precio de 100 € más gastos de envío. Los libros estarán autografiados por el autor. Los interesados pueden escribir a ballesterolmos@yahoo.es (Asunto: “Libros”).